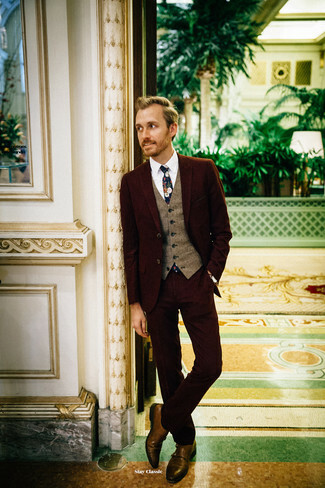 Pair a burgundy suit with a brown wool waistcoat like a true gent. 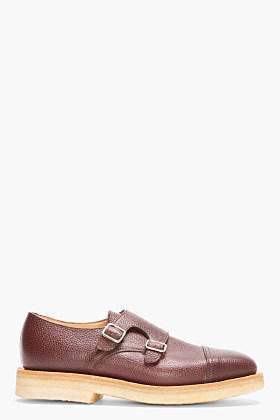 Go for a pair of brown leather double monks to make the outfit current. 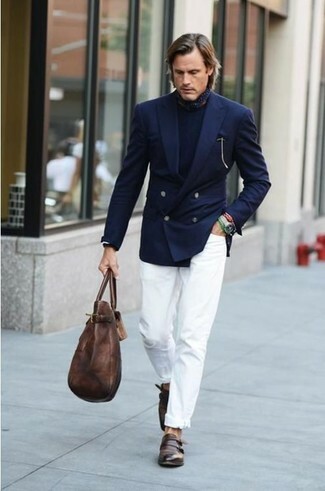 For a smart casual ensemble, wear a navy blazer and white jeans — these pieces the place of work really smart together. 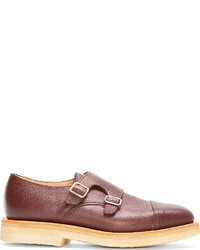 Amp up the cool of your outfit by completing it with Mark McNairy brown scotchgrain leather double monks from SSENSE. Tap into refined, elegant style with a tan suit and a white and blue gingham long sleeve shirt. When it comes to footwear, this outfit is complemented nicely with Mark McNairy brown scotchgrain leather double monks. 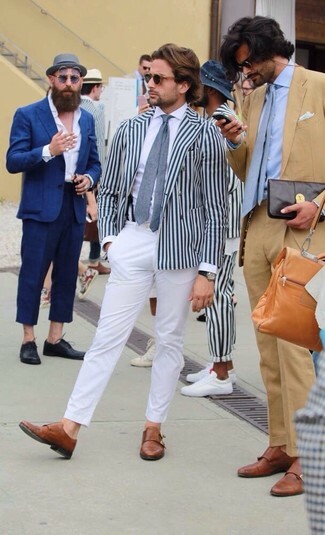 For a casually elegant getup, consider pairing a white and navy vertical striped double breasted blazer with white chinos — these two pieces fit really well together. 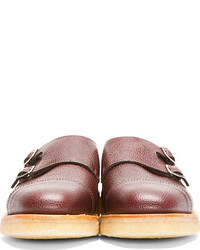 Amp up the cool of your look by rounding it off with Mark McNairy brown scotchgrain leather double monks. 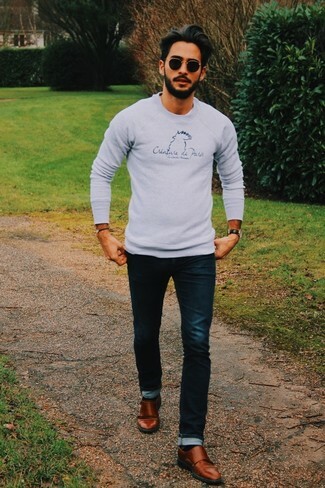 Go for a grey print crew-neck sweater and navy skinny jeans, if you feel like practicality dressing without looking like you don't care. 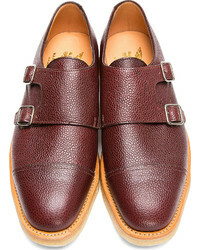 Bump up the cool of your getup by completing it with Mark McNairy brown scotchgrain leather double monks. This combo of an orange polo and olive camouflage shorts is clean, dapper and so easy to recreate. Amp up the cool of your look by rounding it off with brown leather double monks. 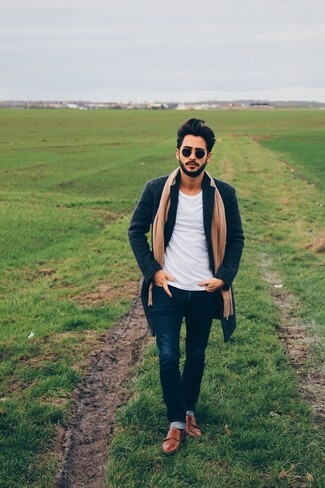 If you're in search of a casual yet stylish ensemble, wear a navy overcoat and navy skinny jeans. Both garments are totally comfortable and will look great together. Add brown leather double monks to your ensemble for an instant style upgrade. 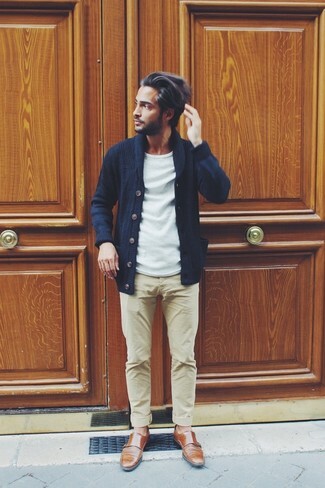 This combination of a navy shawl cardigan and beige chinos is super easy to throw together in no time, helping you look on-trend and ready for anything without spending a ton of time rummaging through your closet. Make brown leather double monks your footwear choice to kick things up to the next level. A classic and casual pairing of a charcoal blazer and navy jeans can maintain its relevance in a multitude of settings. Why not take a dressier approach with footwear and complete your outfit with Mark McNairy Brown Scotchgrain Leather Double Monks?